He died 享保17年(1732年) ６月13日 at age 86.
the handfan . . .
La main tenant l' éventail. 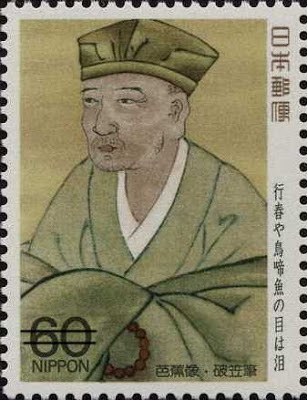 Sanpu was born in Edo, Nihonbashi, Odawara town 江戸日本橋小田原町. 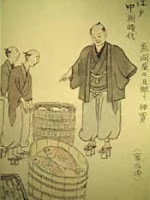 Sanpu was an official fish merchant of the Bakufu government in Edo. 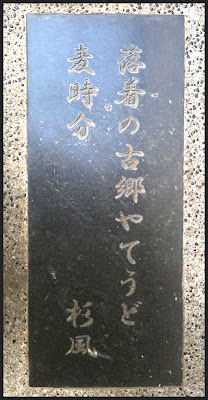 He was also an ardent haikai poet and supported Matsuo Basho in many ways, helping him to establish his Basho school of haikai.
. Shoofuu 蕉風 Shofu, Basho-style haiku . The 10 most important disciples of Matsuo Basho. 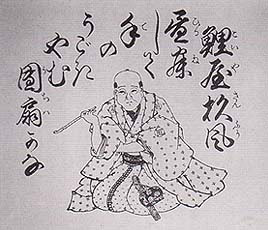 Sanpu provided the Basho-An in Fukagawa for Basho to live in. fish is haiku shorthand for the nickname of his friend, the fish dealer. sakana or uo, fish, can be singular or plural in the Japanese language. Basho uses the Chinese character 啼 for the sound of a bird, not the character　泣く for weeping, crying.
. parting spring, yuku haru 行く春 . This hokku even made it to a stamp. This is a haiku poem in which Basho describes the first bonito catches of the year. Basho lived in the residence of Sugiyama Kensui, a haiku poet known as Ozawa Senpu and a carp wholesaler whose business was named Koiya. Kensui’s eldest son, Sanpu, supported Basho and came to be known as one of the master’s ten most prominent students. Sanpu has been considered Basho’s greatest benefactor. The wholesale carp business, particularly prosperous at that time, made it possible for him to provide such great support. Koiya maintained a carp farm in Fukagawa. Basho later lived in a remodeled cottage that had previously been the caretaker’s lodge at Koiya’s carp farm. The cottage was named Basho-an after a basho (banana) tree growing near the cottage, and Basho adopted the same for his penname. ... On March 27, 1689, Basho set out for the deep north. He traveled up the Sumida River to Senju, where he took his leave from those who had accompanied him on the first part of his journey. It was then that Basho composed the following poem for Sanpu, who had supported him for so many years. It is said that Sanpu tried to prevent Basho from traveling north out of concern for the chill in the early spring air. The cordial relationship between Basho and Sanpu was likely the reason Basho composed this poem. Or, perhaps by mentioning fish, he may have intended to make a clear break from his youth spent at the Uogashi. Basho trusted Sanpu most for his coherent and sound style, unaffected by trends, as well as for his personality. As the first poem above would indicate, Sanpu suffered severe hearing loss. It is said that Basho was very upset with Kikaku for teasing Sanpu that he would never keep up with the world because of his hearing disability. Sanpu also studied Japanese painting at the Kano school, and his art is characterized by realism. 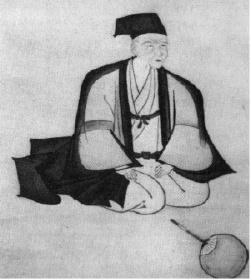 Of the many portraits of Basho, that by Sanpu is believed to be the most faithful portrayal of the haiku master. I tell you, Sanpu, that I shall never forget the generous support I have received from you over the years, even after my body no longer exists. It is regrettable for both of us that my life is ending in an unexpected place and therefore I cannot say farewell to you in person. I hope you will keep working on your haiku and that it provides entertainment for you in your old age. SUGIYAMA Sampu (1647-1732) is known as a patron of MATSUO Basho (1644-1694), one of the best haiku poets in the first half of the Edo period (1600-1868).
. . . He was deaf and weak by birth. Though it is unknown when he followed Basho to study haiku, he was one of Basho's ten best disciples. The 13th day of the sixth lunar month, now in June 13.
a firefly . . .
Had it not been for Sanpu, Basho would never have had Basho-An in Fukagawa. Basho-An had in fact been a caretaker's lodge at a Carp Farm owned by Sanpu's Family's Business, Koiya. 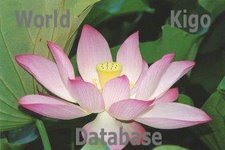 Since it was not the season for lotus flowers, the normal offering for a grave, Basho had to make do with what was at hand. And hopefully the always light-hearted Senpu would accept his sincere offering. The date of this event is not clear. semigoromo 蝉衣 a very thin cloth for summer robes, as light as the wings of a cicada.